Although not receiving the superstar status of their fellow Seattle rockers, the Screaming Trees have remained one of the most important and pioneering bands of the "Grunge" era, and, actually, much prior to it. Starting off in the early 80's and developing a 60's psychedelic and garage sound, along with dirty punk aesthetics and Mark Lanegan's growing-sour throat, the Trees have remained highly important contributors to the Seattle rock revolution of the 90's. Their influence was relevant back than (Nirvana, for example) and still is relevant, located in modern rock acts such as Queens of the Stone Age. 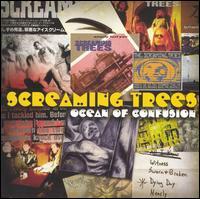 2005 marked the year of ceremonial honor, when it comes to the Trees : Ocean of Confusion is their second collection, reviewing their Epic years (1989-1996). The first collection, which came out in 1991, was filled with less mature and formulated material, a proper SST records release of sorts. Well, it's not like the Screaming Trees had real hysteric hits, apart from Nearly Lost You which gained it's 15 minutes of fame back in '92, thanks to the Singles movie soundtrack. Nonetheless, this collection is highly precious to me, since it represents a formal, official public appreciation that well pays the respect this band deserves, and does it in a precise, efficient way. True, it's a little weird that All I know, which was a modest hit in '96 and a friendly tune is not on this collection, and I might have added to the list the beautiful cover for Jesse Youngblood's Darkness, Darkness plus John Lennon's Working Class Hero, but why be so petty - all the basic, original trademark Trees are here, and it's so damn great, makes a girl wanna cry.